A bride from Bethlehem, Pennsylvania is set to marry in a 120-year-old family heirloom dress that dates back to her great-great-grandmother Mary Lowry Warren’s wedding in 1895. Abigail Kingston will be the 11th bride to wear the beautiful dress that had been passed down through her family from generation to generation. 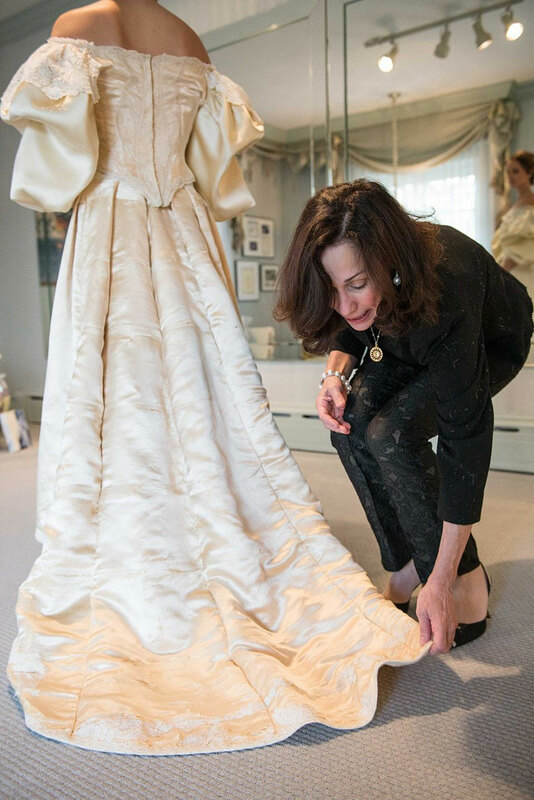 The Victorian-era satin gown has been previously worn by 10 other brides, and the last person to wear it was Leslie Kingston – Abigail’s mother – in 1991. The 30-year-old bride-to-be said that when she became engaged to her fiancé, Jason Curtis, she knew right away she wanted to continue the custom. However, Abigail had to track down the dress first, and she found out that her great aunt Sarah “Sally” Seiler Ogden – who wore it in 1960 – was the current keeper of the gown. The two-piece dress was mailed to Leslie Kingston’s house, but when the bride saw it, she wasn’t sure it would be possible for her to wear it on her big day, scheduled for October 17. The dress was full of holes and tears, and the once-white satin had turned brown. Abigail and her mother thought they were in a hopeless situation, until a family friend introduced them to Deborah LoPresti, a bridal dress designer. LoPresti and a highly specialized dry-cleaner spent 200 hours on restoration, and thanks to them, Abigail will be able to wear the dress when she ties the knot with her fiancé next month. The happy couple will exchange vows at Lake Nockamixon in Perkasie, Bucks County, and the beautiful bride will wear the the vintage dress for the cocktail hour.